Fonseca, A., Souza Jr., C. & Veríssimo, A. 2015. 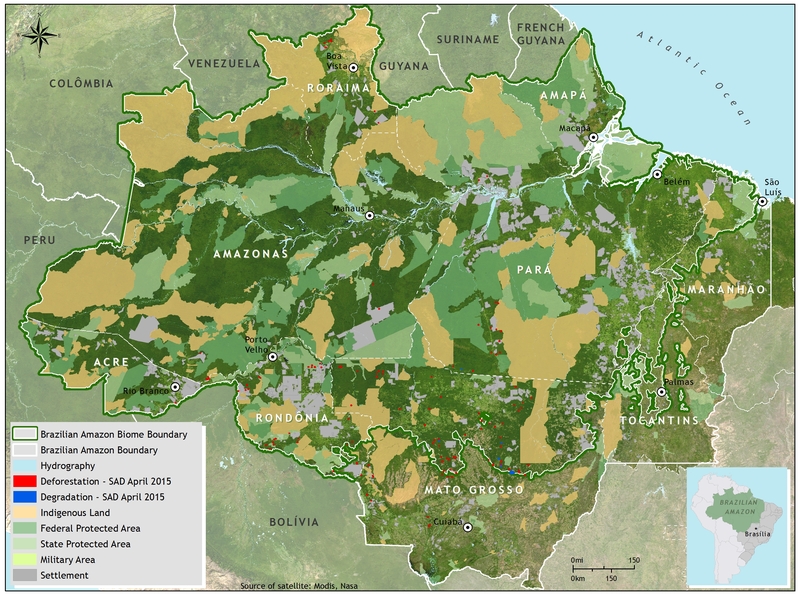 Deforestation report for the Brazilian Amazon (April 2015) SAD (p. 10). Belém: Imazon. In April 2015, more than half (55%) of the forest area of the Brazilian Amazon was covered by clouds, a coverage slightly lower than in April 2014 (59%). The States with the greatest cloud cover were Amapá (86%), Roraima (76%) and Pará (64%). Under those cloud conditions, 137 square kilometers of deforestation were detected, by SAD in the Amazon in April 2015. That represents a 36% increase in relation to April 2014 when deforestation totaled 101 square kilometers. 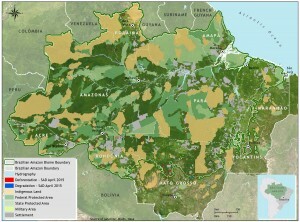 The majority (67%) of deforestation occurred in Mato Grosso (67%) and, at a lower proportion, in Rondônia (15%), Pará (11%), Amazonas (3%), Roraima (3%) and Acre (1%). The deforestation accumulated during the period from August 2014 to April 2015, corresponding to the first nine months to the calendar for measuring deforestation, reached 1,898 square kilometers. There was a 187% increase in deforestation in relation to the previous period (August 2013 to April 2014) when it reached 662 square kilometers. Degraded forests in the Brazilian Amazon totaled 75 square kilometers in April 2015. In relation to April 2014, when forest degradation totaled 189 square kilometers, there was a 60% reduction. « Did Ranchers and Slaughterhouses Respond to Zero-Deforestation Agreements in the Brazilian Amazon?